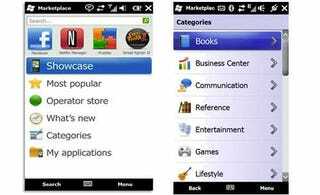 Giz readers have confirmed that Microsoft's app store for 6.5 WinMo phones is already live and kicking, a day ahead of tomorrow's global roll-out Windows Mobile 6.5 Phones. Marketplace support for 6.x WinMo phones is expected before the end of the year. Got a WinMo 6.5 handset? Send us some pics of the Marketplace and let us know what you think.